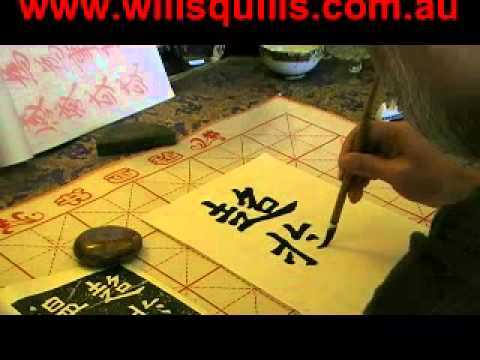 At Wills Quills, we have been providing advice to customers for over 20 years on the finer points of calligraphy- Chinese and Western. 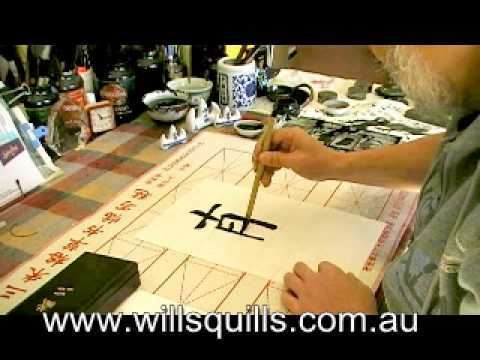 Below are some facts which may help you to get started in Chinese calligraphy and painting. This list will grow over time so make sure to check back later for new details. For our complete list of available brushes and other calligraphy items please refer to the Products menu on the left. for making the mark of "dots"
For our complete list of available brushes, please refer to the Products menu. 2 of the main brush hair types are- Wolf hair is resilient, holds its shape and points well, with these features it is ready to deliver the painting medium to the painting surface (these are the Chinese equivalent of sable). They are great for producing "dots" and "lines" of different quality. Goat hair is very fine, soft and white. They provide large reservoir capacity for ink holding, but tend to hoard the fluid unless it is encouraged by the surface characteristic such as absorbency or surface tension, or in combination of other hairs, as in a mixed hair brush. On its own the brushes are normally very floppy and only good for "washes" or "surface rendering". Yip Gun / Leave Vein Brush Made entirely of "wolf" hair, chosen for its length and resilience, great for doing lines and fine dots. This is available in large, medium and small sizes. San Sui / General Landscape Brush Made entirely of "wolf" hair, in layers of different lengths forming the traditional conic shape, it is designed for point brush and side brush application producing textural or sinewy lines. Ideal for medium dots and lines. This is available in large, medium and small sizes. Dim Mui / "Plum Blossom" Brush Made of wolf hair, and designed to allow the plum blossom petal shapes to be shaped by the slightly shorter and wider brush shape. Ideal for medium dots and lines. This is available in large and small sizes. Therefore choose our company on sales and to distribution. As our company has the smallest cialis price and it is big plus for us How much does cialis cost I can tell you later at personal meeting which has to take place the other day. Deer and Wolf Painting and Calligraphy Brush Made of summer deer hair, (stiffer than winter hair) for its longer length, combine with wolf hair chosen for its resilience to form the traditional conic shape, designed for general purpose line and dot application. This is available in large, medium and small sizes. Extra Large Bat Wan Brush The core hair is made from "rabbit" or "hare", providing slightly better control and maintaining the shape of the brush, coupled with very soft "reservoir" goat hair on the outside collar, the brush is designed for side brush application such as rendering clouds. It is ideal for wash or surface rendering. This is available in extra large, large, medium and small. No.3 Jing Ti Brush Made of pure goat hair, it has good reservoir capacity, designed for large calligraphic marks. But when use for side brush application, it will give an excellent "wash", essential for painting large lotus paintings or splash ink techniques. Ideal for extra large surface rendering. This is available in 6 different sizes. 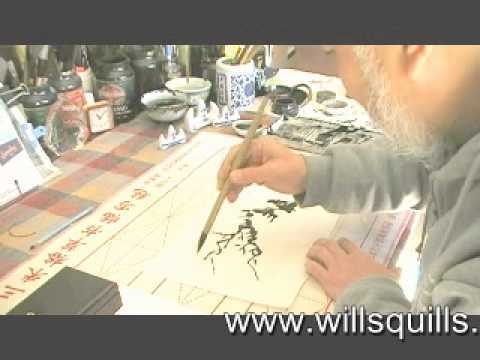 We have compiled a series of educational videos highlighting the use of various brushes (click on image to play video). Please check back as we will continue to publish more videos over time. 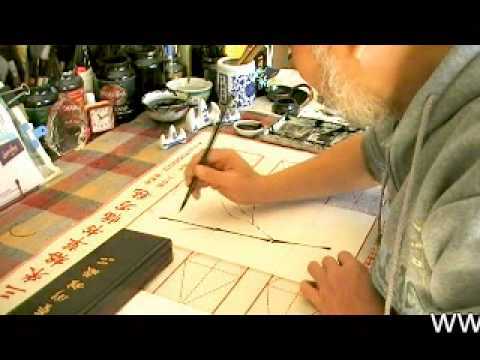 The ink stick grinding process allows the artist complete control of tones and volume. The ink making process in itself represents one phase of preparation - and your mental state. It should be a time of meditation on the subject for painting and to separate oneself from worldly affairs and achieve inner peacefulness, in a relaxed state. 1. The ink stone should be made of a dense slate, so that moisture is not absorbed into it in any great degree. 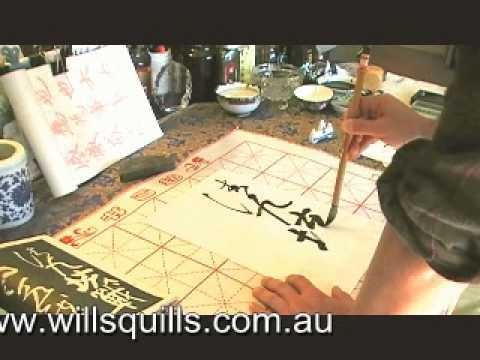 The reason is that prepared ink is ready for use, will change consistency if the stone starts soaking away water from the mixed ink. 2. Ink sticks are very brittle and should be kept in a dark, cool place. The older the ink stick the weaker the "glue" in the ink, but this makes the ink better for sharp and fine lines. Moisture should not be introduced to the ink stick at any time. Remember, never drown your ink stick, only use a few drops of water to start your grinding process. Build up the volume slowly. Only make sufficient ink for one session - "stale ink is like rotten fish". Ink stones must be thoroughly cleaned each time, don't leave any, even in the corners of the stone mixing area. 3. 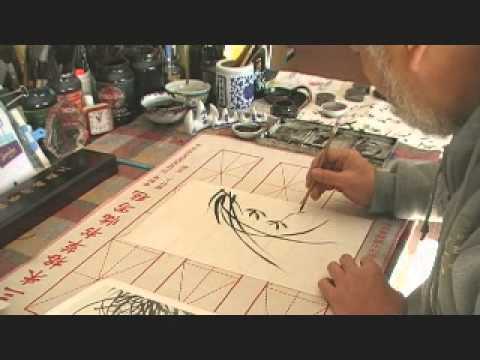 The grinding movement must be kept similar and always be mindful of the edges of the ink stick, at times tilt the ink stick to each side to ensure even wear on the base. 4. If your stone doesn't have a slope that allows the ink to gather together, tilt it slightly so that it does - this makes it easy to load the brush. 5. Use separate ink stones for each colour of ink stick.